I am one of those fickle readers who have William Gibson's early novels - that loose but seminal trilogy of Neuromancer, Count Zero and Mona Lisa Overdrive - on my shelves but have shied away from reading anything else he's done since. To be fair, that decision was taken in my early twenties, when Gibson's gradual move away from cyberpunk into more mature (also read - less futuristic) settings would not have found favour with me at the time. But, since chance threw a copy of Spook Country (2007) into my path, I thought I'd give late-period Gibson a go. Curiously - the book sold me on Gibson as a writer, but not on the novel itself. It reminded me that William Gibson is pretty much the only present-day science-fiction author I can think of who writes like a poet. And the window-dressing in this book - the psychogeographic observations of New York, LA and Vancouver - is beautiful. He's also an astute observer of contemporary societal and technological trends, Spook Country essentially being science-fiction set in the contemporary world, exploring the potential of what is rather than what could be. Reading latter-day Gibson makes me feel like I'm living the future now, which is a rare and uncanny experience. 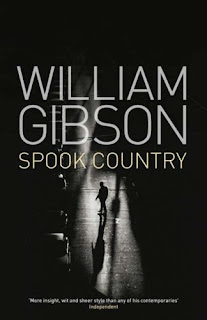 It does seem however with Spook Country that what Gibson really wanted to write was a series of vignettes or feuilleton articles, but what he was contracted to do was a novel. So while the scene-setting, the digressions into cultural review and the aphorisms about the creative industries are great, the plot itself is flimsy. Without getting too spoileriffic, it's a slight piece of cloak and dagger action involving a GPS-tracked McGuffin and different factions in the US military-industrial complex. Gibson pulls out his usual diversionary tactic of switching between different protagonists whose storylines eventually converge, but the ending is enough of an anti-climax as to leave this reader at least rather deflated. Spook Country, then, is a very interesting travelling companion for a while, but the destination isn't worth the journey. Like boarding the Orient Express but finding yourself unaccountably stranded at Blake Street (LOCAL REFERENCE KLAXON). On the other hand - I am definitely going to delve deeper into Gibson's body of work. His writing has only got better and I am belatedly realising there is definitely life after cyperpunk here.